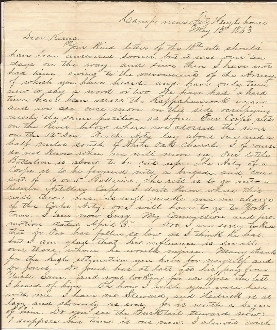 Soldier's Letter, 2 pages, 4to., Camp near Fitz Hugh House, May 13th, 1863. Surgeon M. F. Price (1st Pennsylvania Light Artillery, Cooper's Battery "B") writes pertaining to the Battle of Chancellorsville and the death of "Stonewall" Jackson. "...The Rebs are there in strong force. I guess Stonewall Jackson is dead so we have one great man less to continue against but a great Gen. is lost to the world. What a pity that such a great man should engage and die in so bad a cause..."
Some aging, dark ink and easy to read.